After living in France for nearly a decade, Toru Matsushita returned to his hometown of Osaka and took up where he left off in the French capital. Before long he was settled back into preparing and serving soba. On the surface it was a circuitous route back to Osaka: Matsushita first cut his teeth at Daruma in Hiroshima before transferring to Paris and working at Yen, a soba and Japanese food restaurant in the sixth arrondissement. 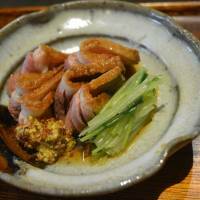 In 2015, he found his way home and opened his eponymous restaurant in a quiet enclave nearby the endless crowds swarming through Umeda. It’s remarkable in certain ways how alike most modern soba restaurants are, in the same way that so many ramen shops are cut from the same cloth. Both deal in noodles and broth, of course, but they have their own aesthetics and atmosphere. Like so many other soba shops, Matushita is equal parts restaurant, kitchen and workshop. From the street, a single long window offers a view of Matsushita, dressed in his chef’s whites, at work rolling and cutting the thin strips of buckwheat dough into noodles. You enter through stark white noren curtains into a restaurant that’s as pared back as a serving of zaru soba (cold soba), the house specialty, which is also an ideal dish for the searing summer heat, even if its starting to wane. Before getting to the zaru soba, we started with a dish that was even more simple, mizu nasu a delicacy from nearby Kyoto. Mizu nasu is a beautiful deep-purple aubergine, the only kind that can be eaten as-is, dressed only in condensation. Such raw vegetables are deserving of a blob of moromi miso, a dark umami-rich soy-bean paste made with rice and barley grains, which adds a layer of taste to a vegetable that, while it’s both fresh and refreshing, is somewhat stark on the flavor front. 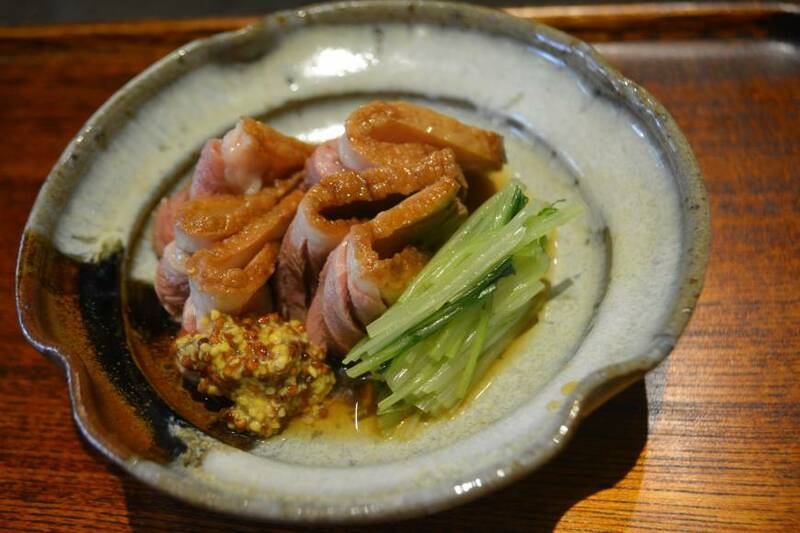 This was followed up with kamo rōsu (strips of roast duck), an item you’ll find on the menu at many soba establishments. It’s a great little dish, and Matsushita stuck to the script here: succulent strips of duck breast alongside honey dijon mustard. Matsushita’s is a small menu, eight items including the soba, so it would be nice to see him open it up a little more, especially as the menu contains no trace of his nine years living in a country as steeped in food culture as France. We finished with the zaru soba, served on a round bamboo basket from which the dish takes its name. Matsushita cuts his soba thin as thread and cooks it al dente, serving it as a loosely knotted pile on the bamboo mat. The accompanying tsuyu dipping sauce, made from a combination of aged soy sauce and bonito stock, is layered with flavors. When you’re done filtering the noodles through it, you can add hot sobayu (soba water) and knock it back to round off a deeply satisfying meal.